If you’re heading off on a trek you might be wondering if you should get yourself a pair of trekking poles? I’m going to go over why I use them and give you a few tips and techniques that will help you be more efficient out on the trail. When I first started to transition from short day hikes to longer trekking and backpacking trips I didn’t see the importance of trekking poles. Throughout the years I had been on difficult terrain without needing poles, so why should I get them now. It wasn’t until my wife bought me a set of poles for Christmas that I realized the error of my ways. On that first big hilly stretch I realized just now nice trekking poles actually are. Why Should I Get Trekking Poles? Honestly, I never saw the importance of trekking poles until I actually started using them. I had a keep things simple mindset and poles just didn’t seem all that necessary. It wasn’t until I actually started using poles that I realized their benefits. Efficient Trekking: You’re going to be able to trek much more efficiently. You won’t have to worry about falling and losing your footing on difficult terrain. Easier on Hills: Facing those big hilly landscapes will be much easier on your body. It’s like having a third leg as you’re working your way up and down the hillside. Waste Less Energy: You’re not going to be wasting as much energy. Long treks aren’t just a short walk through a park. They require a lot of energy and poles can absorb some of that extra weight. Better For Knees: Using poles is going to make trekking much easier on the knees. Your joints and ligaments won’t have to take all that extra pressure of your pack and gear. Distribute Weight: Having a set of poles is like having two extra legs. You can distribute the weight of your backpack into the ground across four points instead of two. Prevents Overuse Injuries: I’m currently a young man, but I want to be out on the trail way into my retirement. The only way that’s going to happen is if I protect my joints now before there’s damage. Why Do People Give Up Their Poles? If poles are so great why doesn’t everybody use them? Throughout the years I’ve talked to a lot of hikers that can’t stand trekking poles. Most of them get a pair of poles and use them for a while without seeing much of a difference. They buy poles use them for a while and think “Oh this is useless and end up giving them away”. Don’t fall into the trap of giving up your poles without ever really using them. It takes a while to actually figure out when you actually need to use poles. You end up using them in a way that’s not really efficient and it seems like a waste of time. So I’m going to show you the way that I use them and hopefully they’ll work for you. 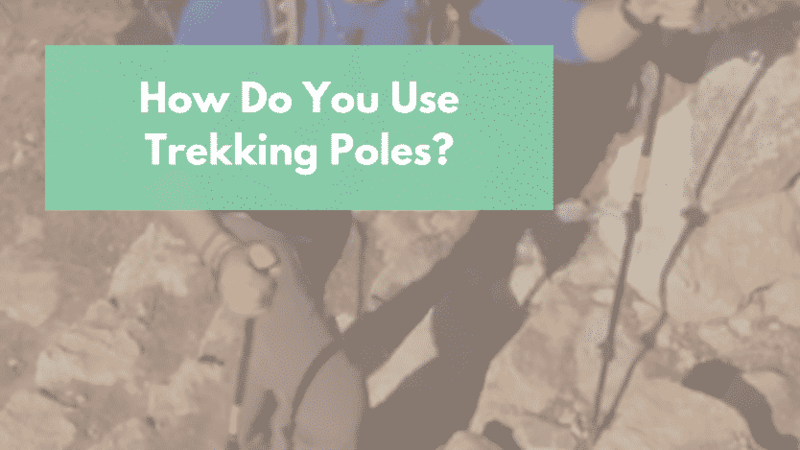 Figuring out how to use trekking poles isn’t all that difficult. That being said, different body types will require very different pole lengths. You’ll have to make adjustments to your pole length based on your height and the terrain you’re hiking. Obviously, a 6ft man will need different pole lengths than a 5ft woman. Flat Ground: Initially, you’ll want to setup your poles so that they have a 90-degree angle to your elbow. When you’re on level ground adjust the poles so that they are parallel to the ground. Throughout the day you’ll probably have to make further adjustments on hills. Uphill: When traveling uphill you should slightly shorten your poles so that once again they make a 90-degree angle to the ground. Downhill: If you’re traveling downhill all day the poles will have to be a little bit longer. It probably seems obvious to experienced trekkers, but most beginners forget to take the rubber caps off their poles. I see a lot of people trekking with the rubber cap still on their poles. They don’t realize that there’s normally a carbide tip hidden inside the cap. That carbide tip is designed to grip onto rock, dirt, sand ETC. Before heading out make sure you know how to hold the handle. You want to hold the handle just like a ski pole. Go with a relaxed yet firm grip with the poles point going forward. Most people don’t know the correct way to use their straps. They actually put their wrists through the strap backwards. You want to come up underneath the handle/strap and wrap your hand over and around the top of the strap. Grasp the handle with your thumb going up and over the strap. This grip might feel weird at first, but you won’t need a death grip to hold onto the pole. You’ll be able to control the pole using the strap and won’t have to hold on the entire time. You should also be able to drop the pole straight below your hand without losing control. It will just hang a few inches below your hand and you’ll have full mobility of your hand. A lot of guys come in from the other direction going up and over the strap, which is actually quite dangerous. It feels much more natural, but that comes at a cost. When you put your wrist in from above all it takes is a slight stumble and the strap will snag your thumb and most likely dislocate/break it. All it takes is a slight trip and trying to catch yourself with your hand to stop your fall. Okay now, that’s all great to know, but how do we actually use them when we’re on the trail? When heading up a steep section you’re going to trek asymmetrically. So move with your left foot forward and right arm forward. Then alternate feet as you move down the trail. When you’re climbing uphill you’ll want your poles a little shorter and then longer when traveling down. Don’t worry, most of us naturally move with the correct movement pattern. When walking you don’t want your poles sticking straight up and down. As you move they should be at a 70-degree angle facing forward. The pole should land at about the same place as your foot. It’s all about figuring out the angle that gives you a little bit of forward propulsion. It really isn’t all that much help on short hikes, but multiply that little bit of help over the course of a day and it’s a big difference. Going downhill is when you notice the biggest amount of impact. A significant amount of your packs weight is going to go off your legs and into your hands. You’ll get a lot more stability and a significant amount of weight off your body.